There were lots of goodies in the latest rue mag, but here are a few of my favorites. I'm actually going to start out with one of the ads featured in the issue. This is from an ad for The Foundary. 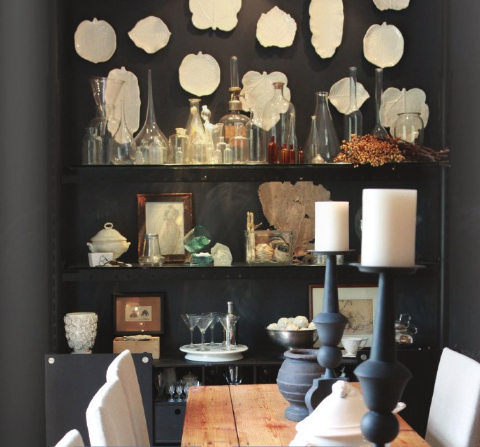 I love the white platters contrasted against the charcoal walls. The shelves (I need some of these) house several collections that look effortlessly stunning. And can we just talk about the warm and weathered dining table juxtaposed against the sleek white upholstered chairs? Talk about a beautiful symphony. Next up is a design by Monika Claasen. The neutral color scheme, simple and mix of materials had me from the start. And again, I'm totally digging the baskets bringing interest, height and texture to an otherwise bland wall. If you've read my blog for awhile, you may have noticed there's one thing you never see on here. Red. I'm not normally drawn toward the color red in any decorating instances (well okay, maybe at Christmas), but I have to say that Jessica Marx did it right. 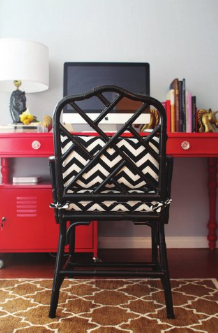 This little red desk looks fabulous with this black bamboo chair and brown patterned rug. Yet another example that black and brown can be and should be used together. And last but not least, let's discuss this charming little bathroom, shall we? I'm not sure what I love most about this space. 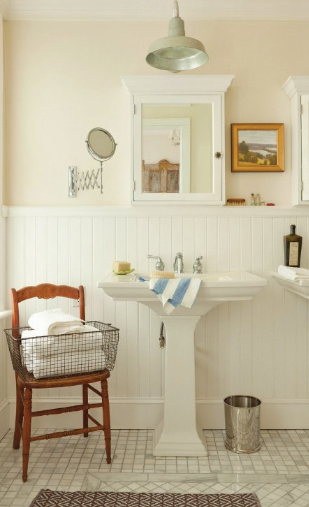 Is it the crisp white beadboard or the industrial light fixture? Or maybe it's the carrera tile or vintage wire basket turned towel holder. Or possibly even the sweet, gold framed landscape painting nestled between the two mirrors. All of these things are already so lovely on their own, and when you put them together, they make what I'd like to call a little piece of design heaven. Which of these four designs speaks to you the most?